Assistant Professor and Distance Education Coordinator Clint Stevenson facilitates a variety of outreach courses in food safety. Photo by Becky Kirkland. When Assistant Professor and Distance Education Coordinator Clint Stevenson first started in the Department of Food, Bioprocessing and Nutrition Sciences, he was tasked with navigating online learning. Since then, he established a team to produce for-credit and non-credit online courses in food safety to reach the food manufacturing industry in a new way. The non-credit courses are a product of WolfWare Outreach — the enterprise-level learning management system used to host online, non-credit, fee-based offerings. From required trainings to best practices and specialty courses, Stevenson and team have created a successful outreach program in food safety for the food manufacturing industry including food service, restaurants and retail. One of the most successful courses is an artisan cheese food safety basics course. Developed with instructors from across the country and the American Cheese Society, the course brought in more than 800 registrants. 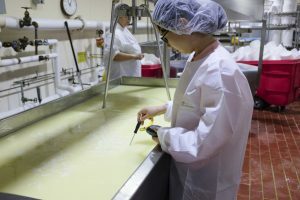 A student from Cornell University learning the science and art of cheesemaking. The photo is used as an example of the process in the artisan cheese outreach course. “We had people from all across the world — regulators, ice cream and cheese makers, and even some who do consulting go through the course. It has five modules on the basics for why and how to safely make cheese for the public,” said Stevenson. Other courses include a Hazard Analysis and Critical Control Points (HACCP) training and a good manufacturing practices course. The HACCP certification is required by an auditor whereas the good manufacturing is a course to learn best practices. In addition, Stevenson’s courses help organizations meet the requirements of the 2011 Food Safety Modernization Act. As one of the most significant events in food safety history, Stevenson and his team designed outreach courses to help organizations learn about and meet the requirements of the act. His program eventually achieved enough enrollment and feedback from past participants to pave the way for course improvement efforts, which are currently underway. In fact, the artisan cheese course was evaluated by his recent Master’s student, Madhu Dutta, in her thesis. Stevenson’s courses, in particular, fill a need for working professionals or for those who may be looking to transition into the food industry. Since the industry will always thrive, it is a desirable field for those looking for a career change. The flexibility of the self-paced, online courses makes it a perfect solution for those looking to make the switch. Outreach courses are not only flexible for prospective students, but also for the instructors. “If you have e-learning modules, you can write quizzes, put it online, create a REPORTER e-store, and you’re in business,” said Stevenson. 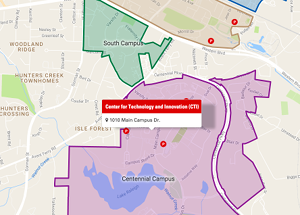 REPORTER is NC State’s registration platform for non-credit activity and required training. It tracks, manages and reports non-degree credit activity. Stevenson noted that with REPORTER, it makes offering outreach courses more seamless than in the past. Recent upgrades to REPORTER have given Stevenson the ability to issue certificates to participants, allow a manager to sign up multiple employees for a course, create discount codes, administer course evaluation surveys to past participants and more. “WolfWare Outreach is a one-stop shop to do everything from hosting a course and e-store to getting technical service on setting up all the details,” said Stevenson. Stevenson added that WolfWare Outreach provides instructors with more proceeds than any alternatives for outreach course hosting. To get the word out about the food safety courses, Stevenson worked with Associate Vice Provost for Marketing and Partnership Development Kay Zimmerman to develop a webpage to market the courses. DELTA offers assistance getting set up and taking your outreach courses to the next level. 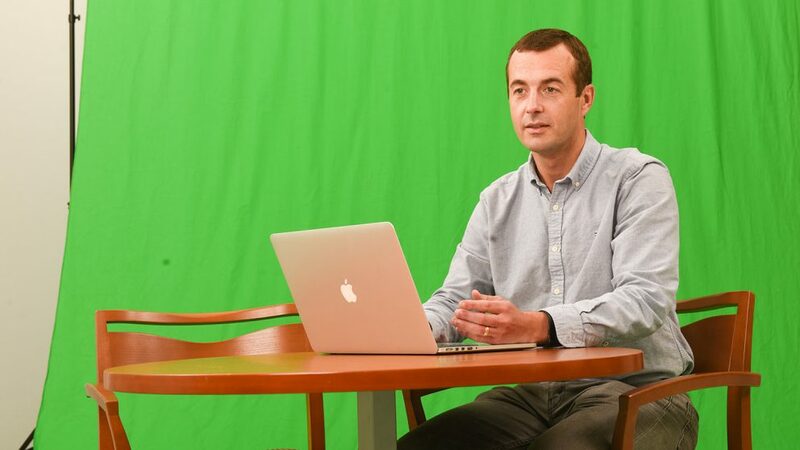 For the future of both Stevenson’s outreach and academic course, he plans to continue incorporating immersive and on-the-job learning into each course. “That’s the challenge in any training program whether it’s online or face to face, taking people on the job and showing them where it matters,” he added. In many of his outreach courses, Stevenson adds 360° video for students to better interact and engage with the content. Stevenson hopes to have a lab that is known for best practices and is using outreach as a way to offer his expertise in food safety to the rest of the industry. As Stevenson said, it’s as easy as repurposing your existing content to reach new audiences. WolfWare Outreach is a low-investment option to help you reach your goals for online, non-credit, fee-based offerings. For more information about WolfWare Outreach, visit our webpage and fill out the Get Started form.